You know how awesome it is when you discover a healthy, tasty meal that everyone in the family loves? And it’s quick to make, to boot? This is one such meal. Isa Chandra Moskowitz, vegan chef extraordinaire, has blown me away with her recent cookbook, Isa Does It. Every single recipe I’ve made from this book has turned out fabulous! One of my favorite sections of the cookbook is entitled Bowls (And Plates): My Idea of a Heavenly Dinner. In this section, Isa puts together complete meals – usually some combination of grains, beans, and veggies, tied together with a sauce that can top all three components. The flavors and colors in each bowl or plate complement one another perfectly – taking all the guesswork out of the meal. The Chimichurri Pumpkin Bowl is our family’s favorite. My 11 year old was helping me to unload groceries last week, and as soon as he saw the pumpkin seeds and the soba noodles, he said, “are you making that meal?” When I said yes, he dashed off to share the good news with his brothers. That is how good this dish is! The first time I made this, I used butternut squash instead of pumpkin – but I’ve since branched out to make it with whatever orange vegetable is in season or catches my eye at the grocery store. Pictured above is half a baked sweet potato, but I’ve also made this with cubed and roasted sweet potato or winter squash, or baked winter squash. What really makes this dish is the delicious chimichurri sauce. It’s bright, tangy, and a little spicy, and goes so well with everything that I got a little carried away in my drizzling here! I’m a bit generous with the pumpkin seeds as well. I’m normally a bulk bin kind of gal, but for my pumpkin seeds, I spring for Eden Dry Roasted Pumpkin Seeds. There’s just something about the way they roast these that makes them a step better than the rest. For this recipe alone, I would recommend getting your hands on this cookbook. Luckily, the whole book is filled with awesome recipes, and cooking tips, and such gorgeous photos that it makes for entertaining reading material before you even set foot in the kitchen! Other winners from this book are: Dilly Stew with Rosemary Dumplings, Lentil-a-Roni, Potato-Cauliflower Pasta with Breaded Tofu, Marbled Banana Bread, and Chai Spice Snickerdoodles. That’s just the tip of the iceberg – so check this book out, and get cooking! I was hoping to cook several more meals from this cookbook to add to this book review, but alas – sometimes plans change. 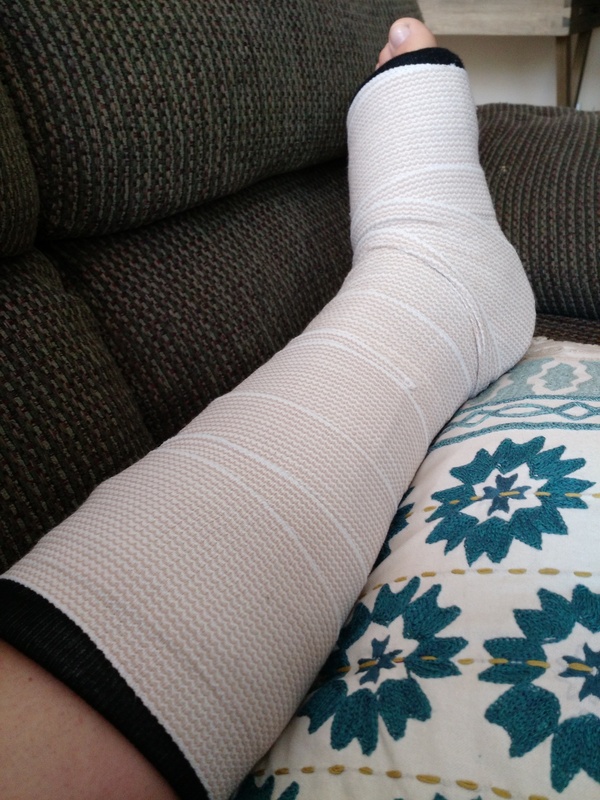 While running down the stairs in stocking feet earlier this week, I slipped, twisted, and fell, and now I’m laid up with a broken ankle. Bummer! The cooking duties have fallen on my husband and childrens’ shoulders for the time being. I’m in good hands – they are quite good cooks! In fact, my son made Isa’s Marbled Banana Bread a couple of days ago, but we gobbled it up before we remembered to snap a photo. Have you tried any recipes from Isa Does It? What are your favorites? What meals do you have in your arsenal that are sure to please every member of your family?